Two stained glass pieces represent the work of artist Mirjam Seeger, whose works will be on display and for sale at the Malvern Retreat House Art Show in Malvern through Feb. 7. 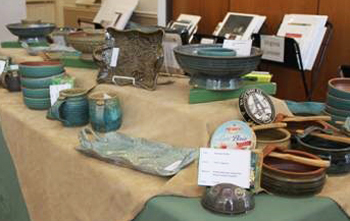 Tom Longacre’s functional stoneware is included in the Malvern Retreat House Art Show. More than 2,000 fine art pieces will be for sale as 100 of the Philadelphia area’s best artists showcase their works at Malvern Retreat House’s Art Show 2016. The juried fine art show continues through Sunday, Feb. 7 and includes a special focus on glass art, along with art forms ranging from painting and photography to jewelry and sculpture. Billed as one of the region’s largest annual art shows, the event this year has attracted a number of accomplished glass artists for the special exhibit. Among them is Mirjam Seeger, whose work has appeared in numerous places, including many churches around the country and the Union League of Philadelphia. Seeger spent about 20 years creating stained glass art professionally, but she has now branched out into other glass techniques and is bringing a different glass art form to Malvern. “I have combined the painting and fusing of glass to create art pieces that I don’t see anyone else making,” Seeger said. She will be joined by other fine artists with decades of experience. Well-known Chester County artist Richard Bollinger began his career in the commercial illustration field where he created drawings for elementary school workbooks and for Ranger Rick magazine. He transitioned into work as a painter, and today his art is represented in more than 125 galleries and at places such as Valley Forge National Park where he made a commemorative painting for the park’s 100th anniversary. Scores of other artists will join Bollinger and Seeger at the show, which will include items for people with a range of budgets. Returning this year will also be functional stoneware artist Tom Longacre, who sold the most pieces at the previous two shows. “I like that people can afford my work and take something home from the show,” Longacre said. Overall, more than 2,000 fine art pieces will be for sale. The event will include a complimentary wine and cheese social on Thursday, Feb. 4 from 5-8 p.m. when attendees can meet the artists. Regular show hours are 10 a.m.-7 p.m. on Wednesday through Saturday and 10 a.m.-4 p.m. on Sunday. The event will be held in the McShain-Horstmann Family Life Center that can be accessed through Malvern Retreat House’s Entrance B at 315 South Warren Avenue in Malvern. For more information, visit malvernretreat.com/artshow or call 610-644-0400. All proceeds from the show benefit Malvern Retreat House.